Modern villa on the beach, large private pool, BBQ, many flowers very quiet. 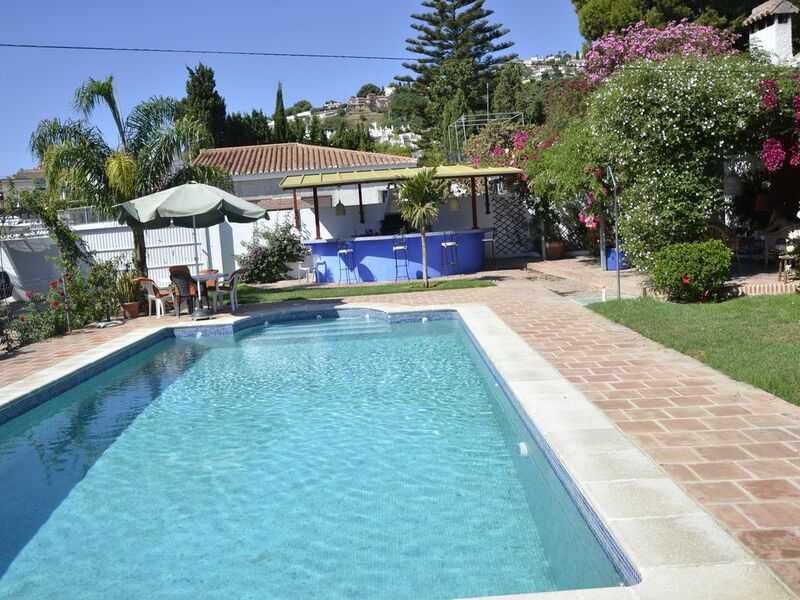 fully renovated luxury close to one of the best beaches in Almuñecar home. Large garden of 800 meters, jasmine, roses, flower of paradise, orange, bougainvillea etc with a large pool and wonderful flowers. large porch, ideal for barbecues or paellas with friends. It has three bedrooms, three bathrooms, living room, kitchen and dining room. Very cool in summer and quality in winter, fireplace, heating and air conditioning, although not necessary. Porch outside with a living and dining room for 10 people. Also another room for breakfast very cool in summer. Four loungers for sunbathing by the pool, and a garden with orange, cherimoya, mango, avocado. WIFI and satellite TV. Parking inside the house, and is also very easy to park on the street. Very quiet, you will only go to the birds, but at the same time very close to the beach and Almuñecar, where there is a lot of atmosphere of all kinds, Restaurants, pizzerias, pub, young atmosphere etc. House clean, well equipped and stylish. Kitchen/ diner area very good. Bedrooms and bathrooms excellent - very comfy beds. Garden lovely with plenty of seating and eating areas for 8 people. Unfortunately and unusually it rained pretty relentlessly for six days, and the sitting room and dining area can only accommodate 4 people so it was a bit cramped. Very much recommended especially as a summer place. Beautiful villa with great outdoor space. We had a lovely stay here in July 2018. The house was well decorated, maintained and comfortable. The outside space was wonderful and we spent most of our time sitting in the comfy shaded areas, on the sun loungers or in the pool. We made lots of use of the BBQ and bar as well. We were travelling with a baby, 2 year old and 3 year old and the toddlers had a great time in the pool. We were within walking distance of a park, the beach, local amenities and restaurants. Carmen was extremely accommodating and kind to us during our stay. Would definitely recommend. Four adults and two children enjoyed one week at Carmes Villa. Overall a great stay where the outdoor area by the pool is really outstanding with a lounge/bar area. We spent the month of October 2017 in Villa mi Padre and we could not have had it better! The vila is perfectly located only a short walk from the beaches and very good beach restaurants. The house is very comfortable and fully equipped with everything you need. And the garden is beautiful!! With a very large pool, several fruit trees, a very nice eating area and a fully equipped BBQ and bar area. We would certainly recommend Villa mi Padre for your next vacation.